New Year's Eve. Fifty degrees outside and a sunny day. I went out to water stuff in the greenhouse and thought I would share some pictures. Our greenhouse gets most of its use in the early spring when it holds our tomato and pepper transplants, protecting them from frost. However, it does not go unused in the wintertime either. First of all, it is fifty degrees outside, but it is a whopping 85 degrees in the greenhouse! I thought I was going to have to change into shorts while I was in there. I have a lot of little aloe plants. And a couple of huge ones. I'm afraid this one is going to fall over before I can get a bigger pot for it. I also have a couple of flowering plants that Tom started when he went through the Master Gardener's class. One of the Master Gardener sessions was on taking cuttings to create new plants. I'm afraid the name for these plants has been lost and I have no idea what they are. All I can say is that they thrive on abuse, require little water and bloom profusely. I never fertilize them. I have a few cactus plants, as well. A small one is visible in the lower left of the picture above. My favorite one is the one below. I also have a pot of lemon grass. This spring I will plant it outside, but it is not frost tolerant and has to be brought inside to spend the winter. There are also a few little fig trees that we got from a friend at the farmers' market. She took cuttings off her trees for me. I will let them grow another year in pots before planting them outside. Here are some strawberries that I had in pots last summer. I was afraid the pots were too small for them to survive the winter, though, so I dug them up and put them in temporary pots in the greenhouse. I'll plant them outside this spring. The remaining sweet potatoes that we grew this year are also in the greenhouse. It is a great place to store them over the winter. All is not rosy in there, however. Here are a couple of "dead as a door nail" plants that got shoved to the back of a shelf and didn't get watered and/or froze during the recent cold spell where we had low temperatures near zero. We were lucky last year to have a mild winter. Well, lucky is a two-way sword because without cold enough temperatures to kill insects that are over-wintering, then we had a worse insect problem during the summer than in past years. However, that changed last week. On Friday, we had really nice spring-like weather. Temperatures almost in the 70s. Then early Saturday morning the wind changed to the north and brought in what the TV weather folks called the polar vortex. Brrrrr. They weren't kidding. The temperature plummeted all day. In fact, the warmest temperature of the day was at about 6:00 am! It snowed a bit, but not much and it did not stick to the roads. So, that much was great. However, by Saturday night the temperatures were in the teens and by daybreak they were in the single digits. Yeah, I know there are readers who will laugh at me for whining over our cold weather when this is the norm for them in the winter. Just call me a wimp, okay! The last picture in that article shows how we kept our birdbath from freezing using an electric de-icing pad. As it turned out, it did not work very well, mainly because it kept causing the electric circuit where it was plugged in to blow a switch which, in turn, caused several of the outlets in our kitchen to switch off! Not good. We ended up discarding that and just taking out fresh water every day. Normally, this was enough because if the temperature was near 30 degrees and the sun was out, then the water would stay unfrozen until nighttime. During the polar vortex we just experienced, the birdbath water froze solid and Tom had to chip some of the ice out in order to add fresh water. That turned out to be harder than it looked and took a lot of time. Did I mention my husband is not a fan of cold weather? The problem was that it did not get warm enough during the day to keep the water from freezing solid again within just a few minutes, and eventually, the birdbath was full of frozen water. So, he decided to just take out a disposable pie tin full of fresh water. This worked pretty well because it was easy to dump out the ice when it froze and fresh water could be added. His feathery friends were very thankful. I think the solution is to get a heated dog bowl for the birds. I've heard these work well. Of course, the polar vortex is over and warmer weather has arrived. In fact, temperatures are forecast to be in the 60s this weekend. We will think spring has arrived! A couple of years ago, we attended an organic growers conference. It was well attended and we learned a lot. One of the things I really liked was the fact that they had several hands-on demonstrations. One of them was titled "How to Grow Pea Shoots". That caught my interest at once. Pea Shoots? Really? I had never heard of such a thing. I have grown mung bean sprouts. Those are the bean sprouts that are a common ingredient in most Chinese stir-fries. Anyway, I attended the demonstration and came away eager to try this myself. However, other things demanded my attention and it was not until early this year that I got around to it. Basically, you just throw some pea seed onto a container of dirt and let them grow! So, easy, right? Well, there is a little more to it. So, here's how I did it. I suppose any type of pea seed would work, just be sure that the seed is not treated. I used Dwarf Grey Sugar peas. First, I soaked the peas in water overnight. The next morning I drained them in a colander. The next step was to fill a flat with 1.5 to 2 inches of potting soil, sprinkle the seed evenly over the surface and water well. The flat should then be covered to keep the light out and maintain a moist environment. I used another flat turned upside down, like this. In two to three days the peas begin to sprout. I usually leave the lid on a couple more days to force them to grow taller. Then, I uncover them and let them grow until they are about 6 inches tall. Don't forget to keep them watered! Finally, I simply use a pair of scissors and trim the tops off. These are great in salads or cooked in stir fries. So, try your hand at growing some for yourself. You don't have to use anything as big as a growing flat, like I did. You can simply recycle a shallow cardboard box or take-home container from a restaurant. Also, we are fortunate to have a small greenhouse where I grow them, but you can just set them in a sunny window. Just be sure to turn the container around everyday. Otherwise, they will all grow toward the side where the light. Pea shoots store well in the refrigerator and stay fresh for up to 2 weeks! The secret is to NOT wash them and put them in resealable plastic bags until you are ready to eat them. Extra water in the bag causes them to deteriorate faster. They are delicious fresh in salads or used in stir-fries. A while back I wrote about our sweet potato harvest. We grew them in cattle supplement tubs. One of the sweet potatoes we harvested was huge. It weighed six pounds! I had little hope that it would be edible, thinking it would be too fibrous and tough to eat. But we put it in the greenhouse to cure and this week I decided to cut into it and see if it was fit to eat. It took a big, sharp knife to cut the monster in two. But, it was not tough and looked like any normal sweet potato. So, I cut the smaller section into cubes. It still looked good and I cut the rest of it up. There was way too much of it to use at one time. So, I decided to cook and freeze it. I could have roasted it, I suppose, but instead I cooked it on top of the stove in a little bit of water. There was so much of it that I had to cook it in several batches. Before freezing it, I made some sweet potato muffins. These are delicious and have very little sugar in them. Most of the recipes using sweet potatoes I have found call for one cup of mashed sweet potatoes. So, I divided the cooked potatoes into one cup portions. These I sort of smushed into a roll and wrapped in plastic wrap. I was able to fit two of these rolls into a sandwich bag. In the end, I had two sandwich bags containing a total of four cups of sweet potatoes. In recent months, I've become an ardent fan and advocate for community gardens. The growing movement to start community gardens in our cities first came to my attention on one of my favorite shows, Growing a Greener World. If you do a quick search of this site for "community garden", you'll find a multitude of references to community gardens. Community gardens give apartment dwellers and others, who do not have access to land where they can have a garden, a chance to have their own little garden plot. Not only are there numerous health benefits to gardening activities, but excess produce from a community garden can help feed the hungry in our communities. It is amazing how much one can grow in just a small 5X10 foot plot. We recently visited our friend, Cheryl, in Portland, Oregon. Cheryl participates in a community garden near where she lives. The city of Portland sponsors a community gardening project in which residents can rent plots in one of the numerous community gardens scattered across the city for as little as $12. To read more, here's a link to their website: Portland Community Garden Project. Cheryl took us on a tour of her garden. She participates in the Kenton Community Garden. This garden was created from an underutilized city lot in 2011 and covers a little over a third of an acre. While the land area is quite small there are quite a few plots of varying sizes included. Here are some pictures from inside the garden. While looking for information about community gardens, I ran across this website: American Community Gardening Association. If you click on the "Find a Garden", you can search on community gardens in your area. Last summer I wrote about our cattle tub garden. I planted rhubarb in a couple of these tubs and filled the rest of them with strawberry plants and sweet potato slips. Several of the strawberry plants died, probably because it was so hot this summer and the fact that the tubs are made of black plastic which absorbed the heat and made matters worse. Next year, I will move the ones containing strawberries to where they receive more shade. The sweet potatoes, however, loved the heat and did great! I was pretty sure we were going to get some nice sweet potatoes when a few weeks ago I looked under the leaves of one of the plants to see this! Today, we finally had time to harvest them. It was much easier to dig them out of these tubs than in the past when we planted them in the garden. Plus, there were no weeds and the deer didn't eat all the leaves. 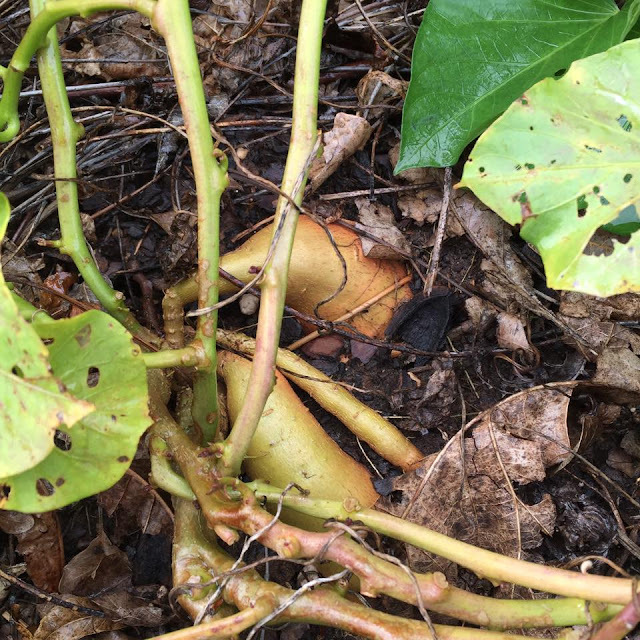 Sweet potato leaves are deer candy. They love them. Having been planted in potting soil, the vines were easy to pull up. We started out using a spading fork to dig the potatoes up, but eventually found that it was just as easy to dig them with our hands. We found some very large potatoes, like this one. But, that does not compare to this monster that weighs 6 pounds! In the end, we had a really good harvest of sweet potatoes of all different sizes. I always enjoy digging root vegetables. It is like digging for buried treasure because you never know what you will find. Like today, we found a sweet potato "braid". Isn't that awesome! I can't wait to cook some of these. I am wondering if the monster potato will be too tough and fibrous to even be edible. I will have to wait a couple of weeks to find out. The sweet potatoes have to cure for a few days before they are ready to eat. So, for now, they are spread out on the shelves in the greenhouse. It's been a while since my last post. Lots of things going on here, including a trip to Portland, Oregon which included a visit to a community garden in which a friend of mine has a plot. I am planning a blog article on that in a couple of weeks. So, stay tuned! This post, however, is about an idea I saw in a magazine earlier this year on how to build a chicken self-feeder. I've written about our chicken coop several times. It is pretty small, so I am always looking for ways to save space in there. The current feeder hangs on a rope from the ceiling in the middle of the coop and is in the way when we need to clean the coop or work in there for any reason. The idea I saw used PVC pipe and fittings to create a self-feeder. Yesterday, I made a trip to our local Lowe's to get the parts for this. There are four pieces. The pipe is about 3 feet long with a cap and screw-in top. The bottom piece is just a regular trap, like you would use under a sink. It was rather like putting together a jigsaw puzzle, looking through all the bins of plumbing supplies to find the ones that worked together. Tom attached it to the wall of the coop with brackets. Meanwhile, the girls were outside oblivious to the changes going on inside their coop. We needed the help of a funnel to fill it with chicken feed. The screw-in lid went on last. And the U-shaped trap kept it from spilling out the end. The girls were unimpressed with the new object, but soon learned it contained food. When I went in a couple of hours later, they had eaten the feed down to the bottom of the curve. It appears we may have to cut an inch or so off the open end so it will be shallow enough for them to reach the food when the level gets to the bottom. I grow fennel in my herb garden for several reasons. First of all, it is a beautiful plant that has lovely yellow flowers and ferny foliage. 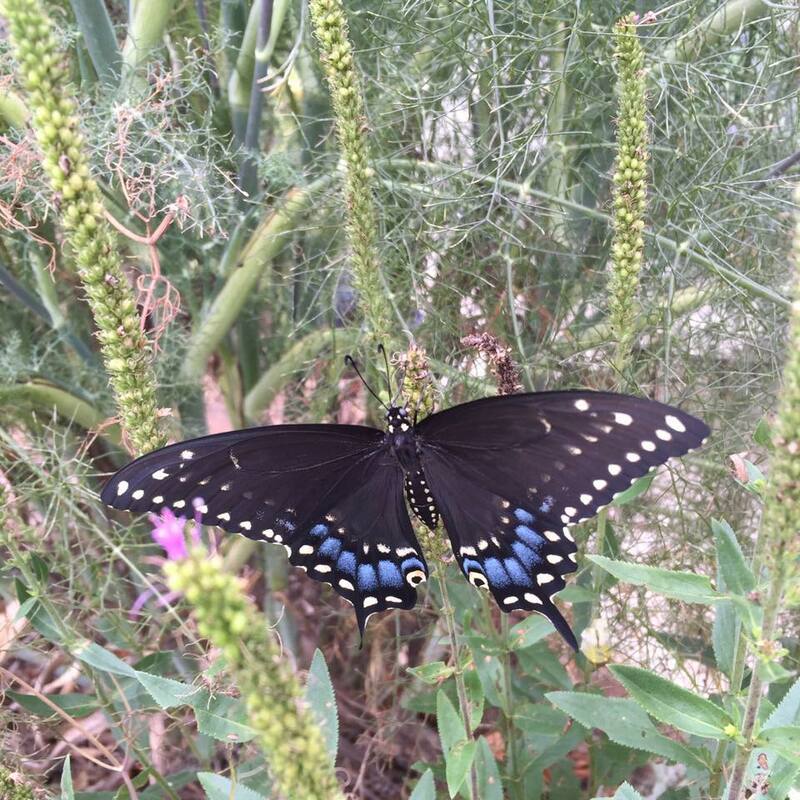 Second, it is a host plant for Black Swallowtail Butterfly caterpillars. If you look closely at the picture above, you'll see several if them. Like this one. Here's the type of butterfly this one will turn into. The last reason l grow fennel is because it has wonderful flavor, both the leaves and the seeds. Let me clarify something, though. There are two types of fennel. This is the kind that is grown for the leaves and seeds, not the bulb. The kind that makes the bulb is called Florence Fennel. That type is difficult to grow here in Oklahoma. Our hot summers are too much for it. I was a little late harvesting seed from my plants this year. Many of them have already fallen to the ground. Here's what they look like growing on the plant and after picking. I like to pop a couple in my mouth ever so often and chew them which produces a burst of refreshing anise flavor. Today, I made a cup of fennel tea. I first took about a teaspoon of seed and crushed them in my mortar and pestle. I put the crushed seed in my teapot basket. I love my little enamel coated cast iron teapot! The basket is made of fine mesh wire and fits down in the teapot. Next step was to pour boiling water over the fennel seed, put on the lid and steep for a few minutes. I drank the tea straight, but I'm sure it would have been better with a touch of honey! Fennel is a perennial plant and will come up year after year from the roots. It requires very little care and even makes a nice plant for your flower bed. It gets rather tall, though, so put it toward the back of the bed. I encourage you to give it a try. I don't think you will regret it.